In their most recent Design Notes newsletter, the folks at Design Within Reach wax seriously poetic about a salt shaker. Wietlisbach’s story (you knew there had to be a story) begins in 1997, when he was traveling around New Zealand. Among his backpacking gear was a stash of salt, which he kept in a 35mm film canister. As you’ve already guessed, one day the top of the canister popped off, and salt was scattered throughout his gear and unmentionables. After a few choice words and a bit of foot stomping, Wietlisbach finished his trip salt-free, and began work on a new kind of salt shaker. Using feedback from the field, Wietlisbach made his design even smarter. For starters, he made the two caps differently shaped to help differentiate salt and pepper, even in the dark. 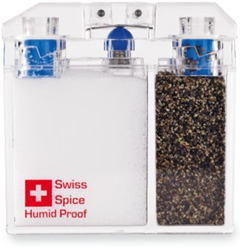 For all your blackout/blindess/blindfolded salt-and-peppering needs: the Swiss Spice Salt and Pepper Shaker. 20 bucks!